Artist resumes require their own unique format. Download the sample below and follow our resume tips for artists to help you write your own. Artist with 3 years of related work experience, as well as portfolio of varied accomplishments including referenced articles, exhibitions, and academic achievements. Possess a strong sense of artistry and forward-thinking, that is consistently displayed across all art pieces. Capable of communicating with clients regarding specifications for customized art pieces. Artists don’t usually follow the same career path as other professionals as there are so many industries that artists can actually work in and display their art. However, a well-established network is still necessary for artists, in order for them to create demand for their work. Although a resume will not be the most important document potential hiring managers will look at for an artist (a portfolio is), to the greatest extent possible, you still need to come up with examples of why you are an artist people should keep an eye out for. In case you need it, a good resource for digitizing your portfolio and getting it wider exposure is behance.net. He explains that he is also accessible to the public, with ability to create customized art pieces. Essentially, he’s made a very compact argument for why he’d be a good candidate in a very short amount of space. Now, the hiring manager seeing his resume will be intrigued, and look for evidence of his claims further in the resume, and later on in the portfolio. 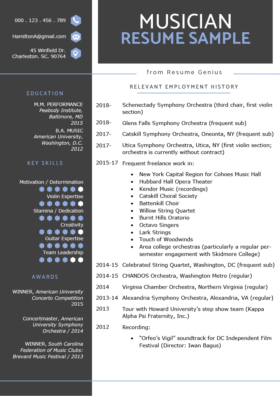 Which resume introduction is the best for your resume? Our flowchart will help you decide. 2. Target your Education, Professional Experience, Exhibitions, Bibliography, etc. An artist resume is different from a standard resume in that it should also include any exhibitions, awards, and published references. The above bullet point proves that the candidate has enough talent and artistic vision. Winning an art competition shows that he is innovative and fresh. As shown above, the artist collaborated with another artist on an exhibition. This shows that he is able to work with others, and most likely capable of communicating to ensure symbiotic relationships. Here, the candidate showed that he worked within a more related “office” environment, and was still able to do so with efficiency. If the artist finds employment with an organization that has deadlines or expectations, this candidate will be able to meet them. When writing your artist resume, consider that it will have quite a bit of crossover with a graphic design resume. Both fields require expertise in design and basic drawing and sketching skills, so you could possibly create a hybrid that would appeal to both kinds of employers. As both art jobs and design work demand plenty of creativity and are creative fields, make sure you play up your design skills. Finally, writing an artist resume or design resume is not like not like writing one for most other fields. Artist resumes require you to pay more attention to certain aspects – like awards, publications, exhibitions, and education – than you normally would for a traditional resume. Fortunately, their are tools like our Resume Genius software, which can guide you through the process of writing an industry-specific resume.